This file is only for use with the models identified. Not all models are sold in all countries. 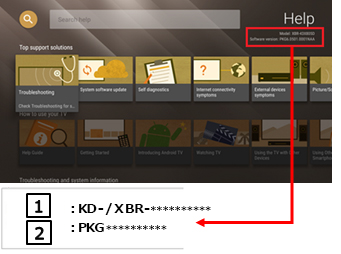 If the version number is "PKG6.0724.xxxx" or higher, you already have the most recent software version and updating is not required. IMPORTANT: The following "System Requirements", "File Info", "Download", and "Install" sections relate to the USB storage device update procedure. You can ignore them if you completed the update using the “Automatically check for update” feature. Do not turn off the TV or disconnect it from the power while it's updating. Verify that the size of the "sony_atvotafull_2018_1600724100_naa_auth.zip" file is "1 146 937 724" bytes. NOTE: For Windows PC, verify the "Size" instead of "Size on disk" on the "Properties" screen. NOTE: After you extracted the downloaded file, you will find the file "sony_dtv0FA70A0BA0AB_00004300_16007241000082.zip". Copy or drag and drop the file "sony_dtv0FA70A0BA0AB_00004300_16007241000082.zip" to the root directory of your USB device. NOTE: The "root directory" is the first or top-most directory of the device, which contains all the other folders. Insert your USB storage device containing the file "sony_dtv0FA70A0BA0AB_00004300_16007241000082.zip" into a USB port of the TV set. If the version number is "PKG6.0724.xxxx" or higher, the software update was successful. If the version number isn't "PKG6.0724.xxxx" or higher, download and install the update again.